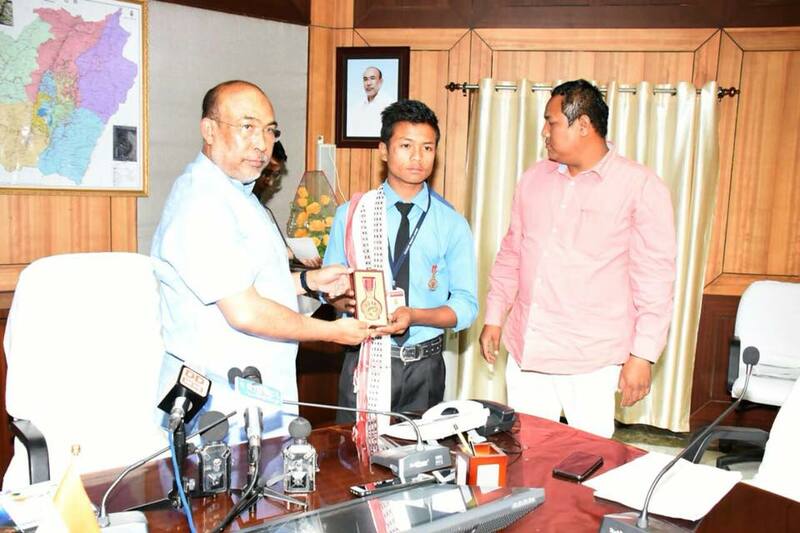 Imphal, June 1 : Chief Minister N. Biren Singh presented ‘Jeevan Raksha Padak Award-2017’ to Master John Lalditsak. The award ceremony was held at CM’s Secretariat today. The Civilian Award ‘Jeevan Raksha Padak Award 2017’ was conferred by the President of India and Ministry of Home Affairs, Government of India to Master John Lalditsak in recognition of his indomitable courage and selfless heroic act for saving three persons from drowning on 12th October, 2015. The Civilian Award consists of Jeevan Raksha Padak Award-2017, Jeevan Raksha Padak Medal, Miniature Medal, Certificate and a cheque of Rs. 1,00,000. Master John Lalditsak is the son of Mr & Mrs. Edwin Lalrosiem Hmar, resident of Saikot, Tuithaphai, Churachandpur District. Speaking to media persons, Chief Minister said that it is indeed a matter of pride for the State that we have such a brave and courageous child like Master John Lalditsak in the State. He believed that the present and future generation of the State should be having such courageous spirit, sacrificial and selfless characteristics like that of Master John Lalditsak. It may be mentioned that the President of India has approved the conferment of Jeevan Raksha Padak Series of Awards-2017 on 44 persons which includes Sarvottam Rasha Padak to 7 persons, Uttam Jeevan Raksha Padak to 13 persons and Jeevan Raksha Padak to 24 persons. Out of these, 7 awards were given to 7 persons posthumously. The Jeevan Raksha Padak Award is a civilian life saving award presented by the Government of India since 1961. MLA of Khurai AC L. Susindro Meitei, OSD to Chief Minister Sumant Singh, Secretary (Tribal Affairs &Hills) and Special Secretary (Home) Kh. Raghumani Singh, Secretary to Chief Minister Ningthoujam Geoffrey, Deputy Commissioner of Churachandpur District Shyamlal Poonia and parents of Master John Lalditsak attended the function.